They have done everything they can to hide the arm. One of the finest needlewomen in the court created an elaborate sling, decorated with jewels and feathers, with the pattern of a swan fleeing a rainbow to chase a radiant moon. The jewels make the sling heavier than his arm, and the feathers — peacock for the rainbow, an egret feather trailing from the moon — make him sneeze. Everyone laughs incredulously as he says this between sneezes, although the needlewoman stitched him a fine handkerchief, embroidered with little swans, that he can place against his nose at need. When she is not watching, he uses a small brown piece of fabric instead. Another woman — a duchess of something or other — presented him, with a flourish, a magnificent cloak, large and heavy enough to conceal both arms. It is stitched with blue and silver thread — more than once he finds himself baffled by just how much decoration these courtiers deem necessary for survival — and like the sling, is itchy and heavy. But it is warm, something he appreciates in the cold months. His brother–in–law may be a king, but he is a king with an eye for certain economies. Even in the depths of winter, the fires in the castle burn low if they burn at all. In the summer, they attach feathers to his other arm, and dress the rest of him in delicate white silk dripping with pearls, to draw the eye away, they explain. His arms remain heavy by his side, even as the feathers shift beneath the summer winds. He spends a lot of time drinking, from glasses etched with feathers. He needs, everyone agrees, some sort of employment. But figuring out what a one armed man with little education or skills, who has spent six years of his life as a bird, can usefully do has proven difficult indeed. Soldiering is out, and as a human, his eyesight is too poor to allow him to work as a lookout or a guard. He could be a courier, but he never learned to ride a horse, and the horses seem somehow wary of the swan arm. Even without the problem of his arm, as the brother of a queen, any form of menial labor is out. One of the clerks is kindly working with him to improve his handwriting — he was left handed before the accident, as everyone is now calling it, as if giving it a new, mistaken name will somehow help, and now must work with the right hand. Perhaps he can eventually become a private secretary to one of the lords, or even the king. An honorable enough profession. Or be given some administrative post. High ranking, of course — the queen’s brother — and he has no real experience, but perhaps — Can he draw? No? Write poetry? Speak another language? They know of a duke in another country who does translations and writes poetry and is by all accounts one of the happiest men in the world. Most fitting. But the handwriting, and the feathers — Ah. Can he sing — no, no he cannot. Ah, they have it: he can be in charge of the queen’s entertainment, ensure that she has all the jugglers and musicians she requires, with clowns and contortionists to amuse her two little ones. He cannot even look at the queen. After everything she did for us, his fourth brother tells him. For you, he thinks. Not for me. His sister says nothing at all, but no longer looks him in the eyes. Is she angry at his lack of gratitude? Guilty that all of the shirts she used to transform them back into boys and men, his was the only shirt unfinished, the only shirt missing a sleeve? Why? he might have asked her. Why was my shirt left undone? Was it to spend more nights with the king? I know the way you could hardly leave his side when you first came, the way that your trips to the wood to gather nettles slowly dwindled, until you gathered them but once a week, then once a month, then less than that. Was it to save your hands? Your feet? Was it because I once punched you when you were a little girl because you had taken something I wanted? He could talk to her. He should talk to her. A feather falls from his wrist. He heads down to the dungeons and says a few words to the guards. He is the queen’s brother, and they relent. She sits in one corner, one leg tucked beneath her, mouth bound against uttering more curses, arms and legs heavy with chains. With his right hand — why, why had the shirt not fallen on the other arm — he tugs off the heavy sling. It falls to the floor in a heavy clanging of jewels. He stretches out both arms to his stepmother. Her mouth is bound against uttering more curses, but her eyes gleam. It might be his imagination, but he thinks her chains shimmer as he steps forward, to free her while he still has a human hand. 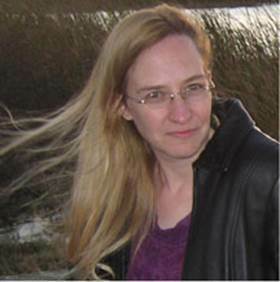 Mari Ness has published short fiction and poetry in multiple publications, including Tor.com, Clarkesworld, Daily Science Fiction, Strange Horizons and previously here at Apex Magazine. For more about her works, check out her blog at marikness.wordpress.com, or follow her on Twitter at mari_ness. She lives in central Florida. “The Six Swans” was by far my favourite fairy tale growing up. I really enjoyed your sequel to it. Nice work!